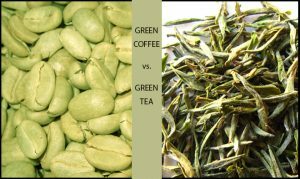 Last week I received an email from one of my subscribers asking me about the difference between green coffee and green tea. I felt I need to write a new post explaining the difference between these two plans and how each one of them helps in weight loss battle. What’s so special about the green coffee beans? Because they are very rich in Chlorogenic acid – times more than their roasted relatives – the brown coffee beans. And it’s the chlorogenic acid that produces the weight loss effect of green coffee beans extract. Chlorogenic acid is a phytochemical – polyphenol – that creates energetic burst that boosts your metabolism so your body instead of storing the fat – it excretes it. Thus you lose weight. How to make sure your green coffee extract works and truly sheds pounds? Well, your green coffee bean extract must contain at least 45% of chologenic acid, otherwise you’ll be wasting money on something that is either fake, or not working because of not enough chlorogenic acid inside. Green tea is made from the leaves of the evergreen shrub or small tree Camellia sinensis, which leaves and leaf buds are used to produce the worldwide popular tea. This plant’s leaves and buds undergo only minimal oxidation during processing and that’s why they do look green in color. There are tons of information about green tea all over the net, but what makes it so special? It’s all about the great antioxidant effect of the green tea extract. Green tea extract is one of the best natural antioxidants with extremely potent antioxidant components. The super antioxidant Epigallocatechin gallate (EGCG) is the most powerful compound of the green tea extract. It is 100 times more potent than Vitamin C.
EGCG is a flavonoid polyphenol (also called bioflavonoid) that protect your body sells from the damaging free radicals. Clinical tests have shown that EGCG inhibits the growth of new cancer cells and kills some existing ones without damaging the normal cells. EGCG also may prevent thrombosis, which is one of the causes of heart attacks and stroke. The green tea weight loss effect is due to the EGCG antioxidant that increases energy expenditure and accelerates fat burning without increasing heart rates. So which way to lose weight would you choose? There are many factors like the price, customers’ reviews, effectiveness. Although, the last one is quite subjective and in most cases – way too unreliable. After all not all weight loss products and natural supplements work the same way for everyone, right? There is also something else every time you get to picking and choosing such weight loss product – I will call it a “weight loss trend”. The one your best friend’s using right now, or perhaps the one you’ve heard about in some popular TV show, or may be the same product your favorite actress has been taking? I don’t know for you, but I would definitely go for my best friend’s choice. How about you?